When the Guardians of the Galaxy come back in early 2019, fans might not recognize them. 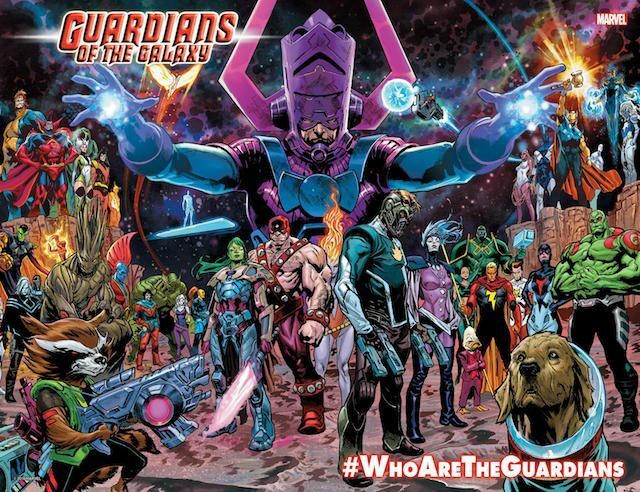 Writer Donny Cates and artist Geoff Shaw will relaunch the series with a new lineup, and as part of the PR push, they are making vague hints, releasing cryptic and exciting images, and encouraging fans to get on board with Marvel's #WhoAreTheGuardians hashtag to tease more out of them. "Geoff and I have some INSANE plans for our first Guardians arc," Cates told Marvel's in-house blog. "This arc is called 'Endgame,' and as seen in Thanos Legacy, it begins with the reading of Thanos's last will and testament. An artifact that Thanos's brother Eros dug out of his late brother's heart, which very well may spell doom for the entire universe. What horrid secrets are contained inside the will of the titan?!! Find out this January!! And oh yeah... our new lineup. Well, that's a surprise as well. Use the hashtag #WhoAreTheGuardians online and maybe we'll give out some teases as we get closer! See you all in space!" The new image, seen above, features virtually every major player in the Guardians of the Galaxy comics since the events of the Annihilation storyline. The teaser first appeared in the back matter of Thanos Legacy, out today. Cates and Shaw are known as the creative team behind the popular “Thanos Wins” storyline and the Image Comics miniseries God Country. The #WhoAreTheGuardians hashtag calls back to the “#WhoIsTheRider” tag that Cates introduced on social media while teasing the identity of the Cosmic Ghost Rider. The Rider turned out to be Frank Castle, the Punisher, and it is worth noting that he is included in the teaser. Cates is currently writing a Cosmic Ghost Rider miniseries which, introduced a new version of the Guardians of the Galaxy led by Cable. While Cable and his Guardians are not included in the teaser, their appearance seems to foreshadow this announcement. The mystery of the new Guardians of the Galaxy team is likely being preserved to avoid spoiling Infinity Wars. The ongoing event series heavily involves the Guardians of the Galaxy. Gamora has become Requiem and gathered the Infinity Stones. Drax was working with Adam Warlock to guard the Soul Stone. Star-Lord, Drax, and Groot also had possession of a Stone. Now that Gamora has them all, it is unclear who will be left standing to form the new Guardians team. The modern Guardians of the Galaxy began with Dan Abnett and Andy Lanning’s run in the early 2000s, which spun out of the Annihilation event. When the characters gained new popularity from the Marvel Studios film, Marvel Comics put the series in the hands of Brian Michael Bendis. Bendis wrote the series for several years before handing it over to Gerry Duggan. Marvel then decided to cancel the series to make room for the Infinity Countdown and Infinity Wars series. The future of the Guardians of the Galaxy has been uncertain ever since, but it seems Marvel does have big plans.